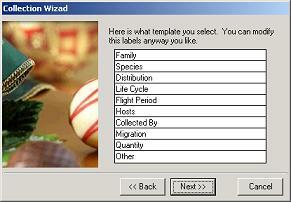 Collection Master provides you with a wizard to step you through the collection creation. Double-click on a column heading and it sorts your collection based on that column. Double-click it again, it sorts in the reversed order. In case you want to re-organize you collections, you may want to move an item from one collection to another. For example, if you have too many duck stamps in your 'US Stamps' collection, it maybe the time to create a new collection called 'Duck Stamps', After the 'Duck Stamps' is created, you don't have to re-enter the duck stamps again into the 'Duck Stamps'. 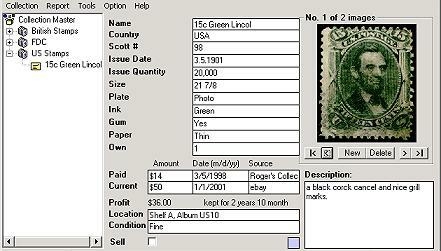 You can just drag the stamp in 'US Stamps' collection to the new 'Duct Stamps' collection. It just a matter of drag and drop. It's so easy. 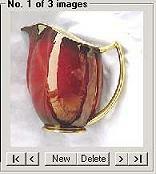 You can also make a copy of an existing collection item by just one click. Save you a lot time from re-entering them again. The smart text box remembers what you have typed. It automatically types for you. Collection Master makes images your friends. It shows the snap shut of each image in the Detailed view. Images are resized to fit into the snap shut window. Full-size the image can also be view by double-click on the image itself. Click the 'New' button to add a new image. To delete an image just click on the 'Delete' button. You can navigate your images by clicking on the arrow button. Go Next, Go To Begining. On the top of the image, it shows you the image number, and the total images you have for this item. You can search all the fields. Double-click on an item in search result, it brings you the Detailed view of the item. Advanced search option let you choose the fields you want to searh.. Using Collection Master is easy. It provides help every where you go. Online help is always available. And also, it has ToolTips, Context menu, and Tips of the day. Collection Master is loaded with features. It has all the features other collection softwares have, plus much much more easy to use features.